Dostoevsky, shown here competing in the 1857 World Dodgeball Finals. For those without comedic tastes, the so-called experts at Wikipedia have an article about Fyodor Dostoyevsky. Tsar Fyodor Mikhailovich Ivanovich Insanovich Stupidovich Dostoevsky (October 30/November 11, 1821 - January 28/February 9, 1881) was a famous Russian author whose books are a compulsory read for anyone who takes a psychology degree in literature. If Dostoevsky ever wrote a funny book, well no one has found it. Certainly the Russian government didn't and would periodically send him to Siberia on a compulsory, no expense paid at all, vacation. 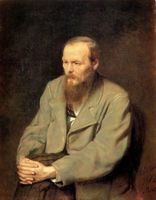 Although his name is spelt Dostoevsky, he lacked the intelligence to spell his name correctly and often wrote it Dostoyevsky, Dostoievsky, or Dostoevski. However, on his worse days (which were more often than not), he completely failed to come remotely close with Фёдор Миха́йлович Достое́вский. He had the same trouble with his other names, and even with the number of names he had, which became reflected in his books, where characters often had twelve or more names (which he also spelt numerous ways because he couldn't remember them all). Dostoevsky was born in Moscow on October 30 and again two weeks later. Moscow was extremely unpleasant at the time; local landmarks included a cemetery for criminals, a lunatic asylum, and an orphanage for abandoned infants. His father Mikhail was a doctor who liked to punish his children if they misbehaved with a compulsory colonic irrigation. In 1849, Dostoevsky was sentenced to death as a practical joke, which was only revealed as he was about be shot. He didn't find this very funny. He still thought, however, that he was convicted of some sort of crime and spent the next four years in jail. Throughout his time there, his cognitive function decreased. He became deeply religious for the sole reason of the church bells, which he enjoyed ringing a lot. For another five years after that, Dostoevsky joined the army, until in 1859 he was discovered to have written plays and was subsequently kicked out. During his stay in the army, however, he met a random woman (whom he thought to be a man) and married her in 1857. She later died in 1864, leaving behind a confused Dostoevsky, who had only just recently realized her gender. Dostoevsky, depressed and in a sort of Crying Game scenario, decided that he should fall in love with something of unmistakeable gender. He chose gambling. Over the course of the next year, he was slowly drained of all his money. In a mad rush to pay for his rent (which his wife usually handled), Dostoevsky wrote Crime and Punishment, a 520-page explanation of the Russian justice system that had somehow acquired a plotline. At the same time, his publisher realized Dostoevsky had repaid a debt with Monopoly money and demanded that he write another book. He responded by writing The Gambler, which told the story of his love for gambling. Dostoevsky appeared to be a loony. He was. Dostoevsky's great friend in these early years Nikolai Vasilievich Gogol, a brilliant writer of search algorithms but pretty lousy when it came to story ideas. Another great emptier of vodka bottles in this Russian literary circle was Leo Tolstoy. This amazing collection of literary talent lasted about a day when Gogol fell down drunk in an empty grave and was buried alive. It was the incident that probably inspired Dostoevsky to despise everyone for their failures and a lifetime of downright misery for anyone who got close to him. Even Tolstoy didn't escape Dostoevksy's bile. When War & Peace was published, Tolstoy sent his friend a copy. When a few months later he asked how he liked it, Dostoevsky complained that its pages had made poor quality lavatory paper. Dostoevsky always bore great resemblance to a mentally insane person, while his writings too appeared to have been written by a lunatic. His most frightening aspect, his beard, was never washed during his lifetime (and it showed). Dostoevsky died in 1881 of emphysema, lung hemorraging, and an epileptic seizure. He was the first man recorded to have died from three causes. Due to his absent-mindedness, he did not realize he was dead until someone told him two weeks later, causing him to have a massive heart attack. Forty thousand people attended his funeral, under the threat of being forced to read The Brothers Karamazov if they did not. Leo Tolstoy gave a famous eulogy, during which half of the crowd committed suicide. Dostoevsky looks more insane than normal. Dostoevsky's writing has been acclaimed as dull, worthless, boring, and stupid by many people around the world. As such, literary critics cannot get enough of it. His writing was heavily influenced by that of philosophers Idiocrates,Moronicus, and God; whom he absolutely adored and loved. During his imprisonment in Siberia, Dostoevsky had acquired a morbid obsession with the Russian Orthodox Church, and often mailed love letters to his local Archdiocese, requesting that these letters be sent with all due haste to Jesus. Eventually, the Church would have to take out a restraining order to prevent Dostoevsky from running up to random clergymen, making love to them, and then buggering off into the night. Dostoevsky was also under the impression that a love of Jesus was the only way he could prevent himself from killing others (though his books obviously killed) and the only way to prevent everyone else from murdering him. Amongst Dostoevsky's most prominent themes were: surrealism, murder, suicide, wounded pride, collapsed family values (due to no Jesus), spiritual regeneration through suffering, Jesus Saves!, evil atheists, rejection of the West and affirmation of Russian Orthodoxy and Tsarism. As such, most biographers agree that Dostoevsky was really fucked up. Dostoevsky claimed to have written his first novel, i maed a yuky doody, when he was only several months of age. However, this was an exaggeration; he was actually 27 years of age when he penned the novel. He also claimed he wrote the entire manuscript of Fisher Price in one day when it really took him most of his adult life. He was also found to not be the original author of the piece of literature either. This was because Dostoevsky was completely unable to keep time. 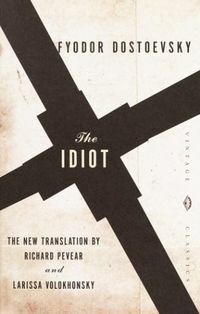 Dostoevsky’s second book, Porr fulk (originally named "Бедные люди"), made him a celebrity. Russians loved the short novel, evidently, despite the fact that every word was horribly misspelled, even the simple, single-letter ones. He also added letters to some words for no reason other than "it looked nice." On occasion, he would begin writing random French or German words (which were also horribly misspelled) without realizing it, while other times he wrote plain gibberish. He didn’t know the difference between the languages. This page was last edited on 21 January 2016, at 08:31.